This past fall, Adirondack lakes and ponds got some much-needed good news. The U.S. Environmental Protection Agency, eight states and a host of environmental organizations reached a settlement in a suit filed in 1999 against American Electric Power (AEP), an Ohio-based power company with coal-burning plants in five states. To cut back the sulfur and nitrogen it has been spewing into the atmosphere for decades—in violation of the 1970 Clean Air Act—AEP agreed to implement pollution-control measures costing $4.6 billion. It was the largest settlement in the history of American environmental litigation. AEPalso agreed to pay a $15 million fine and to contribute $60 million to mitigate some of the damage already done. A portion of that last amount will come to the Adirondacks, where our lakes need all the help they can get. Sulfuric and nitric acids, both resulting from the combustion of fossil fuels (sulfur from coal, nitrogen from coal and gasoline), travel hundreds of miles from their source and pollute distant lakes. 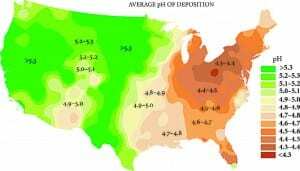 With high levels of precipitation, impermeable bedrock, and relatively high elevations, the Adirondack region is particularly vulnerable to acid rain, which releases aluminum from soils. The aluminum and the acid itself kill fish and other aquatic species. 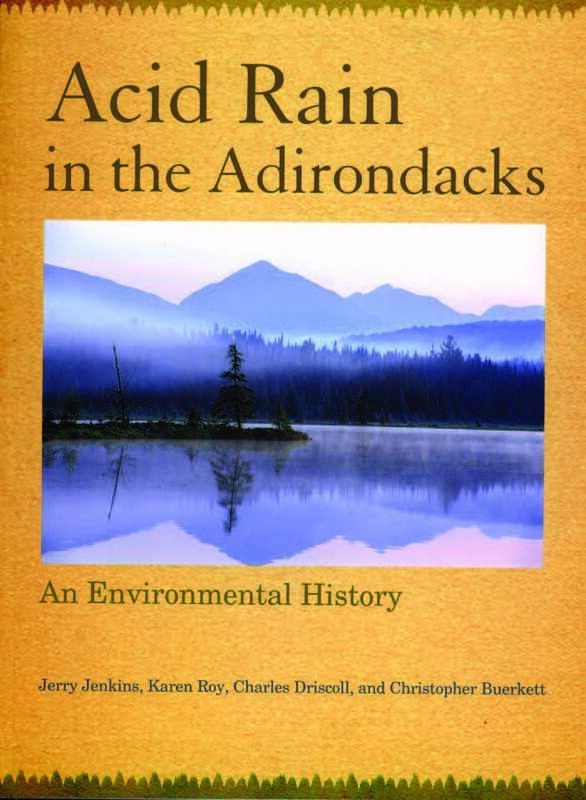 The story of acid rain and its insidious impact is the subject of Acid Rain in the Adirondacks: An Environmental History, an important new book by Jerry Jenkins and three colleagues. There are four names on the cover, but Jenkins appears to be the lead author: He wrote the text, drew the illustrations, and designed the book, all with the same attention to detail and stylistic elegance that characterized his Adirondack Atlas (2004). The other three authors— Karen Roy, Charles Driscoll and Christopher Buerkett— supplied scientific expertise and editing, graphic and bibliographic assistance, while Jenkins did the heavy lifting. His final chapter, “What We Know and What We Need to Do,” is a model of clarity and precision. 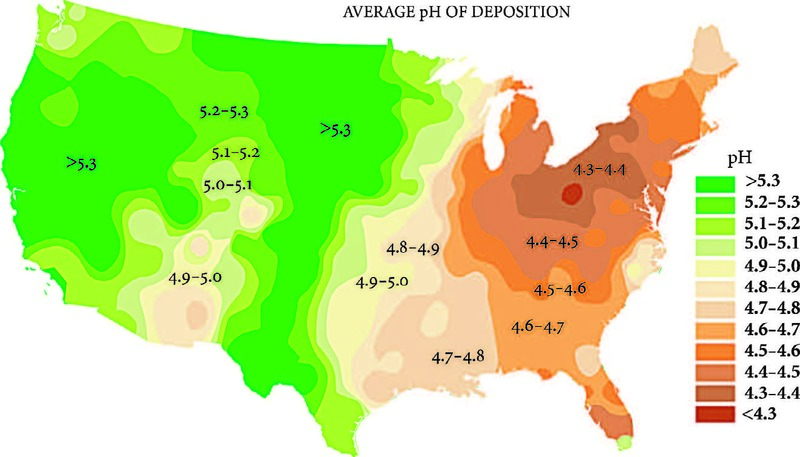 The low pH levels in the Northeast are evidence of acid rain. The acid-rain story begins in the mid-19th century, when European scientists first began to suspect that the combustion of coal, the force driving the Industrial Revolution, produced smoke containing sulfur and that this led to sulfuric acid in the atmosphere. In the early 20th century, the problem was coming into sharper focus, with the discovery that the sulfuric acid in rain downwind of coalburning factories and power plants harmed trees and changed soil chemistry. By the 1950s, it was clear to anyone who cared to consider the matter that acid rain also was harming ponds, lakes and streams far from the smokestacks. In 1970, as part of a suite of legislative initiatives passed in the year of the first Earth Day, the Clean Air Act began the regulation of sulfur—but not nitrogen, which proved to be an unfortunate omission. The amount of sulfur entering the atmosphere slowly began to decrease, but the amount of nitrogen did not. The drive to figure out what was happening to lakes downwind of smokestacks was an epic accomplishment of modern science, with hundreds of researchers working throughout the United States, Canada and Europe. 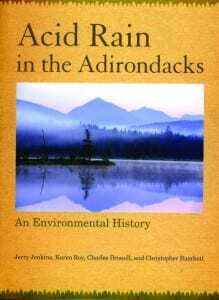 From the start, scientists in and around the Adirondacks were in the vanguard of this monumental effort, and Jenkins describes research projects conducted in the Adirondacks and nearby that established what acid rain is and does. By 1976, when all the acidified lakes in the Park were cataloged, researchers found that half of the lakes over 2,000 feet above sea level had no fish. One of the most significant research projects was the Adirondack Lakes Survey (ALS), which began fieldwork in 1984, completed it in 1987 and issued a report in 1990. The ALS data were expanded and updated in a 2005 report by Jenkins, Roy, Driscoll and Buerkett; that report, subsequently revised yet again and enhanced with voluminous graphs, charts and other illustrations, became this remarkable book. Acid-rain research involves towering columns of data; these are made beautifully and intelligibly accessible via the graphs and illustrations in this book. Meanwhile, an elaborate monitoring system continues the careful watch over bodies of water in the Adirondacks and throughout the Northeast. The ALS examined 1,469 lakes, about half the lakes in the region, and developed a data set that proved to be depressingly consistent with previous research and models. Lakes in the Adirondack Park were (and are) severely acidified, with the worst conditions on the south and west, where precipitation is greater and the soil’s ability to neutralize acid is less than elsewhere in the Park. The higher the acidity, the less diverse the fish population; too much acidity, and there are no fish at all. And there’s plenty of acidity reaching the Adirondacks: Researchers have concluded that in the last hundred years every hectare (about 2.5 acres) at Huntington Forest, near Newcomb, has received more than 3,300 pounds of sulfur via rain and snow. Between 20% and 40% of Adirondack lakes are acidified, with between 10% and 25% of them highly acidified.